TriCore Rubber Foam Pad, Green Series , 1" x 18" x 18"
TriCore rubber foam pads are a great option to isolate vibration from compressors, generators, pool pumps, air conditioning units and many other types of machinery. Each pad has a load capacity of 50 psi and utilizes an all-rubber foam with alternating density layers for better sound attenuation and vibration reduction. 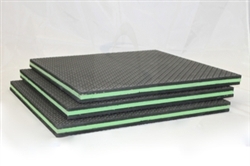 The rubber foam is chemically cross-linked and microcellular, which gives the TriCore Green series of pads better deflection than conventional rubber pads. Install your 1" x 18" x 18" TriCore rubber foam pad without any bolts! These pads are free of halogens, formaldehydes, CFCs, HCFCs and sulfurs and they’re fully recyclable. Shop today to get your vibration reduction project started on the right foot. TriCore Rubber Foam Pad, Green Series, SET of 4, 1" x 4" x 4" TriCore Rubber Foam Pad, Green Series Case, 12 per case, 1" x 18" x 18"
My Polaris pool pump was so noisy sitting on a concrete block. I bought the 18x18" rubber foam pad, cut it in half with my miter saw, and shoved it under the pump!! Very quiet now, hardly can tell when I is running. Wish I would have put one of these under all my pool equipment. ....Next time.